This is also the first Grand Kotei with more than one day of qualifiers as Pax Unplugged only had the Friday. We discovered today that Players can enter into the day 1 qualifiers AND the day 2 qualifiers! Great news for players, but it came as a bit of a surprise for some of the Madrid players who had assumed you couldn’t. In their defense, FFG never announced otherwise so we all assumed it was just like Worlds! 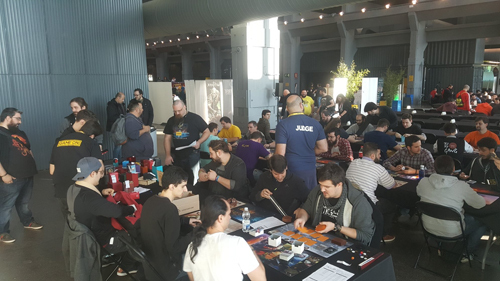 Luckily, once the issue was discovered Alex Watkins from Asmodee stepped in to apologise for the misunderstanding, give those who couldn’t make both days some extra Koku for the prize wall, and those who could free entry into the other day. For all of us, this is great news! Every Grand Kotei has double the number of Hatamoto, tons more games for Koku for the prize wall, and double the opportunity to make day 2. Total attendance for this day was 96 players. 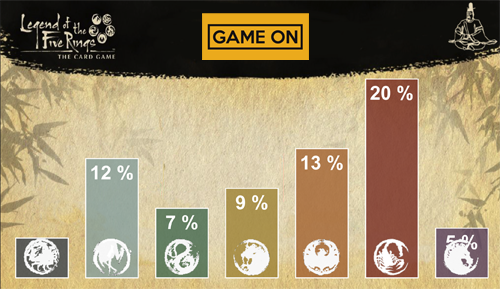 Scorpion (22) had the highest participation with Unicorn (6) at the lowest. At the end of 6 rounds, we have two undefeated Scorpion who achieve Hatamoto: Jakub Irzyk and Pablo Tobias. 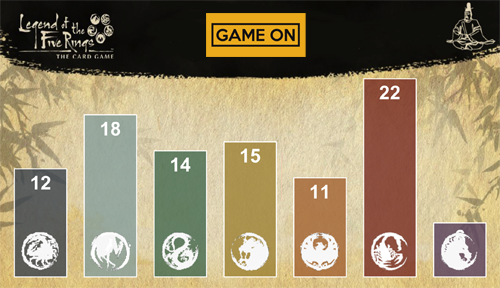 11 Players qualify on 43 or better points: 5 Scorpion, 2 Crane, 2 Phoenix, and 1 Crab. Due to the confusion over the days we’re expecting Day 1B to have a significantly higher number of players (essentially everyone as anyone not already qualified from today’s bracket should be available to play). Tournament is up on Lotus Pavilion. Total players registered is 209 currently. If we assume the 11 who qualified yesterday are the only players who didn’t double over, that is 220 players. *Update – Based on names from the two days it apepars there is a total of 264*. Much less than we had expected. Hopefully we’ll get a little more context from the players as the day goes on. Lots of Scorpion again. 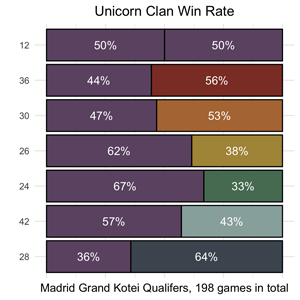 You could definitely make an argument that the better clans have more players. At the end, we have 4 new Hatamoto: Shadowblade playing Lion, Jose Luis S S playing Phoenix, César Jiménez playing Scorpion, and Mario B A playing Scorpion. 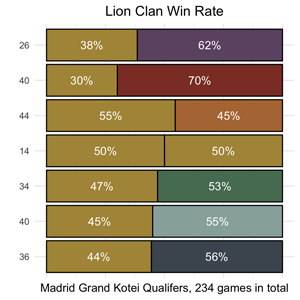 Congrats specifically to Shadowblade who went undefeated with Lion who are commonly accepted as the weakest clan! For day 2 we have another 22 players who qualify. 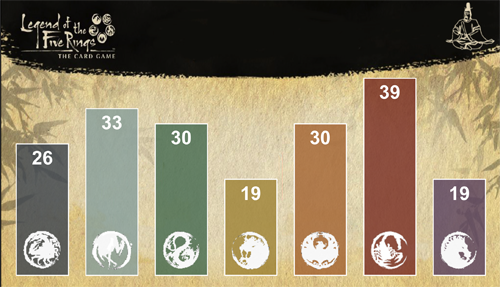 Crab 1, Crane 4, Dragon 2, Lion 2, Phoenix 4, Scorpion 8, Unicorn 1. 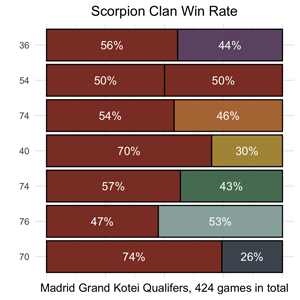 Qualification rates for Scorpion, Phoenix, and Crane have dropped , but relative to each other appear unchanged. The rest of the clans now have a look in. 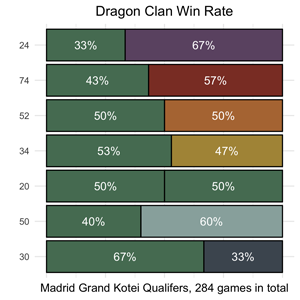 Win rates for both days combined are below. Crab lose hard to Scorpion, Phoenix, and Dragon. 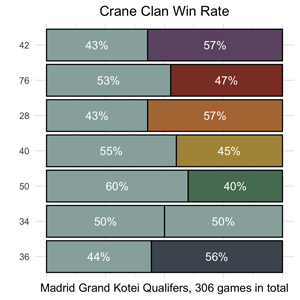 Crane are weak to Unicorn, Phoenix, and Crab. 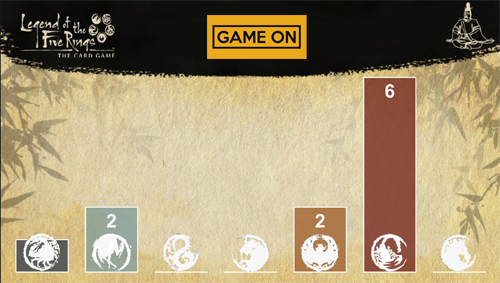 Dragon lose to Unicorn, Crane, and Scorpion. 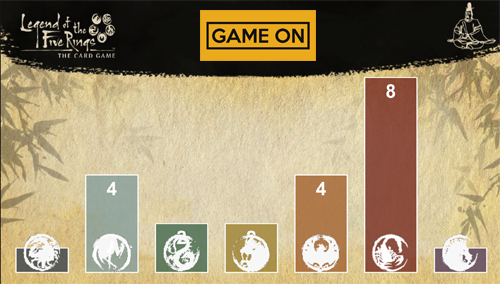 Lion lose hard to Scorpion and Unicorn and are weak to Crane and Crab. 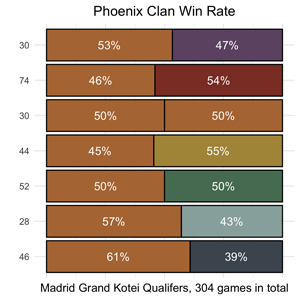 Phoenix are weak to Scorpion and Lion. Scorpion are only weak to Crane. 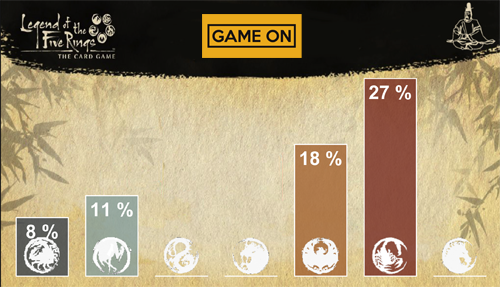 Unicorn lose hard to Crab and are weak to Scorpion and Phoenix. Challonge bracket is up here. The same streams will be up again, but this time Toreadory from the Hidden City Rollers is doing some english coverage. The GameOn stream is also due to have an interview with Tyler around 12:30 GMT or so. As a few spoilers have appeared already we can expect more there. On the new Hatamoto system having less Hatamoto “We wanted to highlight the achievement, we want to make the victories more memorable. To give them something they could strive for’. Maybe this will eventually mean bigger rewards and relevance for those who make the title? No plans to move Worlds out of Roseville (despite Madrid having larger events!) but Tyler did indicate they’re looking at giving a storyline prize to a major European event. 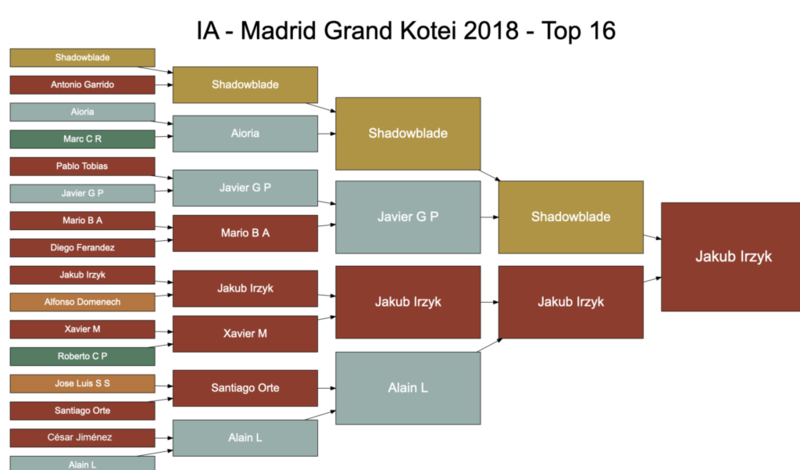 Jakub Irzyk wins another Grand Kotei for the Scorpion clan. The final game will be up on twitch for a bit before moving over to YouTube. I think we might have his 3-3 day 1 list before he made the changes to focus on beating Crane and Scorpion. We’ll do a little more hunting. Thanks. You all do great work. Fixed! I think it was his middle of the night version that didn’t include the last few morning tweaks. The link now goes to his deck where he has a great write up! Thanks guys. It is good to keep up with the tournament scene even though I play casually.